Though the church is the latest to be built on the Island, its roots go back to the very beginnings of the Island's Christian heritage. Christianity reached Essex through St. Cedd, a monk, who landed at Bradwell in AD653, at the invitation of the local King. From there Cedd proceeded with the re-Christianisation of Essex, and built "churches in several places". Meantime Pope Gregory ("the Great") had set in train the re-Christianisation of Kent and of London, through St. Augustine in AD596, intending also to include Essex, but failing in that. The differences in traditions and customs which had developed between these two streams caused mounting problems and annoyances, and these were faced at the Synod of Whitby in AD663: at which St. Cedd played a notable part, as interpreter and reconciler. These influences could scarcely have failed to reach and affect Mersea Island itself, so small but nevertheless important, and perhaps archaeology may one day prove this for the Island, as it is now doing for Colchester and elsewhere. So the Island's Christian early origins is honoured in the dedication of the church to St. Cedd & St. Gregory. Happily, Christian unity continued for several Centuries - until 1534, when Henry VIII, by his Acts of Succession and of Supremacy, forced many English Christians to choose between a distant Pope and a forceful Tudor King. In 1539, John Beche, last Abbott of St. John's in Colchester, was executed. In 1540 Thomas Abel was executed - the younger son of a Mayor of Colchester who had owned lands which included our local Bower Hall - for upholding the legitimacy of Queen Catherine's marriage to Henry in a pamphlet "Invicta Veritas" and thus incurring Henry's wrath. Quiescent during Edward VI's short reign, persecution turned fiercely against the Protestants during most of Mary Tudor's short 5-year rule. Then, under Elizabeth I, it turned against the Catholics again, and our Catholic martyrology stretches from 1570 to 1692, followed by disabilities which lasted into the 19th Century. Much research has been done, and is reported in the yearly "Essex Recusant", but much remains to be done, whilst that for Mersea itself still awaits serious attention. We know of one Recusant, at least, from Mersea, amongst the many who persisted throughout the County - notably the Petrie family, at Ingatestone, from where St. John Paine was taken, and executed in 1582. Perhaps there were others on the Island, left in peace by good neighbours. The Catholic tide is again in flow by the end of the 18th. Century, in the wake of the French Revolution and in the billetting of troops during the Napoleonic Wars. In October 1614, Abbe Benarct, a French emigre priest, on returning from attending to family affairs on the Continent, reported 11 known Catholics in Colchester under his care "apart from soldiers", and 3 others "within 9 miles". A "Colchester Mission" was formally opened in 1837 by Fr. Charles King, in Priory St., and 3 out of 15 parishioners who were "reconciled" came from Mersea. 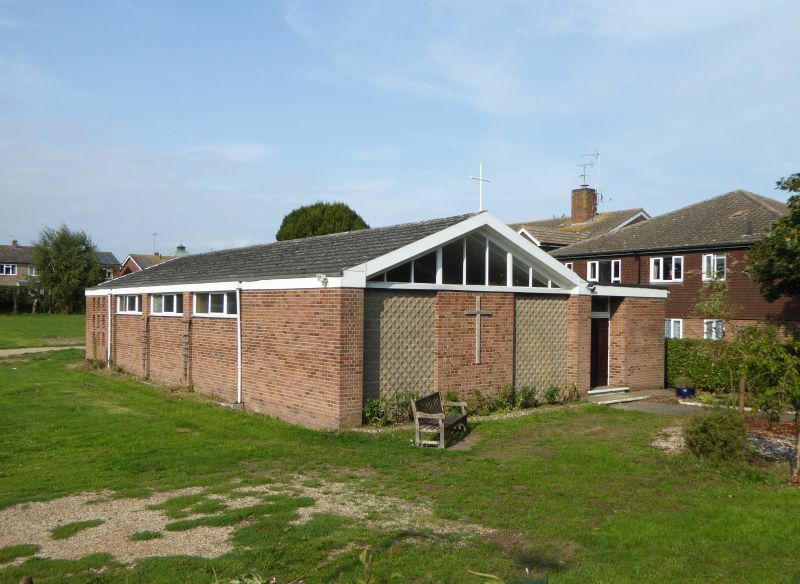 From then on, almost to the Second World War, Mersea Catholics continued to depend wholly on "St. James the Less & St Helen" in Colchester for Mass and the Sacraments. The sense of community amongst Mersea Catholics then strengthened, through Travelling Missions and House Masses, and gradually by more frequent and regular Sunday Mass at the British Legion and WI Halls, and at the International Youth Camp, after the War. It was not until late 1962 that the church of "St. Cedd & St. Gregory" was opened, and Catholics could, after 400 years, have a physical and permanent Island home, for the then 40 or so parishioners. In building "St. Cedd's", Canon Manning had one eye on economy - essential in order to build churches also at Brightlingsea (1958) and Monkwick (1964), and schools. The present building takes only a corner of the site in Barfield Rd., yet 150 persons can be seated at any Mass, and there could be - if needed, and vocations permitting - up to perhaps 4 Masses each Sunday. Because of economy, it has little architectural merit, but it is highly functional, dual-purpose in design, virtually rectangular, with a low steel framework infilled with plain brick, and high plain windows except for a small stained-glass window in the Lady Chapel, which was saved from the contemporaneous demolition of the Parish Church at Langenhoe. The dual-purposes are, of course, complementary: primarily for worship, and secondarily for compatible pastoral and social purposes - which have helped to forge a sense of community not only amongst ourselves, but also with our Island good-neighbours. The altar and the body of the church have been furnished and beautified as much as the simple structure and dual-purposes allow. The church is full to bursting at special times, though, more commonly and more comfortably, Mass attendance varies between perhaps 70-100. For secondary purposes, the altar can be screened behind a moveable partition, and the seats can be re-arranged and tables set up, with almost split-second timing worthy of a professional theatre. The church is kept locked, but each of our families has a key, so that they can pray in rare silence in the presence of the Blessed Sacrament whenever they wish, and particularly in times of stress. We still depend on Colchester for our priests, and we remain but one of the several Mass Centres linked to our Parish Church in Colchester. We now welcome Fr. Leslie Knight, who is no stranger to the parish, and we wait to discover whatever new brooms he may have brought with him! The priests come, in turn, to celebrate Mass each Sunday, at 8.30 a.m., and on Holy Days at 7.30 p.m.: and also on the second Monday of each month, to visit our housebound, and to celebrate Mass at 7.30 p.m. as a prelude to our monthly Committee meetings. They come, too, for Baptisms, Weddings and Requiem Masses, and Confessions. In recent years we have grown accustomed to "Extraordinary (i.e. not-ordained) Ministers" from amongst us, now 12 in number and of both sexes, to assist in taking Holy Communion weekly to our sick and housebound - and to offset the absence of daily Mass on the Island, by a weekly Eucharistic Service, on Wednesdays at 9.30 a.m.
Our ladies "man" our choir, assisted by "ecumenical" organists, and they take the lead in providing coffee-mornings, sewing, selling and other events which consolidate still further our sense of community, as well as raising funds for improvements, and for good causes. A Soiree in aid of St. Helena's Hospice, a Mardi Gras before Lent, a Toy Fair, Barbecues and a sheep-roast, an Auction to pay for new chairs, a "Roaring 20's" Night, a stall at the Lions' Old Time Fair and a Barn Dance are all a part of our growing folk-lore. We are well represented in the wider activities of "St. James" - such as LIFE, Justice & Peace and the links with South Africa and Peru, and on the Committees and Societies of our Diocese of Brentwood and Archdiocese of Westminster. To a degree, this means extra-duties, so that we cannot always find time to do as much as we would like on the Island. But we do join as fully as we can in the many Mersea Societies and activities, and in the volunteer services for St. Helena's Hospice. We are proud of our school-children at St. Benedicts, where "Kid's Aid" was conceived and brought to fruition by a gift of £40,000 to the "Catholic Fund for Overseas Development". But we are, still, relatively few in numbers, though we try to pull our full weight. For reasons which must be largely historical and geographical, as outlined above, we are but a fraction of the National average of Catholics. It might have been different if the projected railway had actually reached Mersea, and the Irish "navvies" had settled here! Some of us are born and bred here, and have lived long lives here: others come from the north, following St. Cedd, and others from still further afield, as did his predecessors: so that we feel quite at home here, and we hope that we are no longer thought of as strangers. As befits the name "Catholic", we live our lives locally, but within a universal context, as becomes more and more evidently essential in the shrinking World now. The above is an edited version of an article written by John Seeley for Mersea Island Society Mistral magazine in 1989. The full article is at MIS_1989_066 . Catholic Church of St Cedd and St Gregory, West Mersea. 50th Anniversary Mass and Barbecue. 1962-2012. Founding families Banks, Bouckley, Davis, Fahie, Golding, Green, Hoy, Jowers, Perry, Richardson, Spence, Sweeney, Tucker and Williams. Roman Catholic Church Catholic Church of St Cedd and St Gregory, Barfield Road, West Mersea.